This entry was posted on Sunday, April 1st, 2018 at 2:25 pm and is filed under Old Rides. You can follow any responses to this entry through the RSS 2.0 feed. You can leave a response, or trackback from your own site. Am I bitter I didn’t do the ride? How can you tell? Thanks, Will, excellent ride. Sorry you weren’t with us, Teresa. Maybe Horseshoe Bay? Thank you Will for leading a wonderful ride on an awesome day! 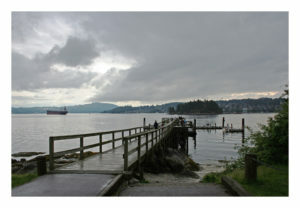 Three riders opted to skip the Belcarra portion and aquaint themselves with the playground equipment at Rocky Point. Lunch was particularly delicious chased down with a beer. On the return along the Barnet, there were two flats. One rider had the ‘curse of the flats’, where there has been a flat at every ride. Thanks to Toby and Sharon, we were soon on our way. We look forward to another excellent adventure!